53 other vehicles were also burnt in the incident which occurred on Thursday. 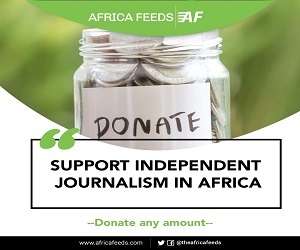 The accident according to officials happened on a motorway that connects Lagos and the city of Ibadan. 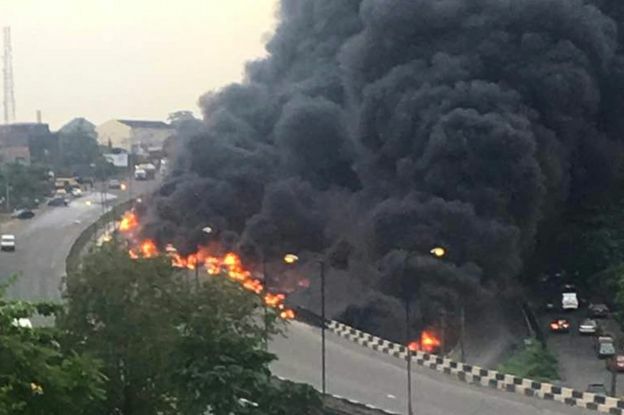 At least nine people have been killed in an oil tanker truck fire explosion in Nigeria’s commercial capital Lagos. 53 other vehicles were also burnt in the incident which occurred on Thursday. The accident according to officials happened on a motorway that connects Lagos and the city of Ibadan. 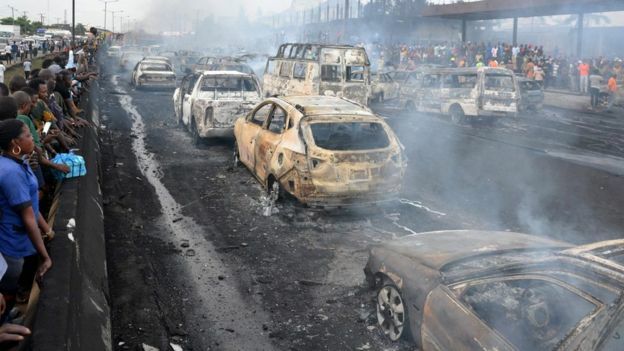 Lagos State Emergency Management Agency (LASEMA) spokesman Adeshina Tiamiyu was quoted by Reuters as saying that “Nine people are dead and four injured are in hospital”. The tanker according to reports crashed after its brakes failed. “We extend our deepest commiseration to the families of persons who lost their lives as well as properties to the incident,” he said in a statement. President of Nigeria Muhammadu Buhari says he was “very sad to learn of the tragic loss of lives”.